OVA-Clec9A-TNE targets cross-presenting DCs and promotes antigen-specific T cell responses. (A) Images of C57BL/6 mice 1 day after i.v. injection of DiR-labeled Clec9A-TNE, isotype-TNE, or free DiR solution as indicated. (B and C) Images of C57BL/6 mice 7 days after i.v. 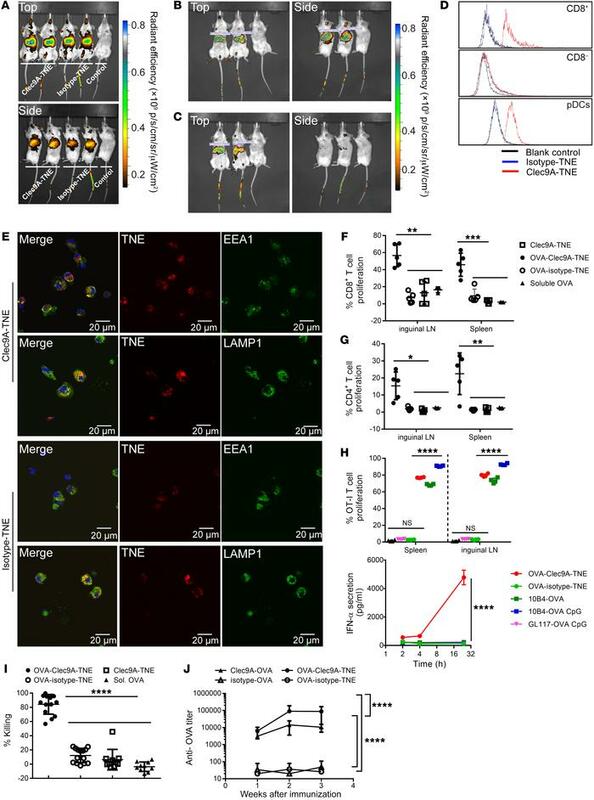 injection of DiR-labeled Clec9A-TNE (B) or DiR-labeled isotype-TNE (C). p/s/cm/sr/μW/cm2, radiant efficiency, total photons per second per square centimeter per steradian in the irradiance range (microwatts per square centimeter); p, photons; sr, steradian. (D) Binding/uptake of TNE by CD8+ cDCs, CD8– cDCs, and pDCs in C57BL/6 mouse spleen 1 day after i.v. injection (n = 3). (E) CD11c+ DCs sorted from naive C57BL/6 mice were incubated with DiI-labeled Clec9A-TNE or isotype-TNE (red) for 3 hours. Cells were then washed and stained with anti-EEA1 or anti-LAMP1 (green) and DAPI (nuclei, blue). (F and G) Proliferation of CD8+ OT-I (F) and CD4+ OT-II (G) cells in inguinal lymph nodes (LN) and spleen 6 days after i.v. injection of 5 μg of soluble OVA, or 200 μl of Clec9A-TNE, OVA-Clec9A-TNE, or OVA-isotype-TNE (formulated with 5 μg of OVA). (H) OT-I T cell proliferation in spleens of mice 5 days after i.v. injection of OVA-Clec9A-TNE, OVA-isotype-TNE (each formulated with 200 ng of OVA), or 1 μg of OVA anti-clec9A^(10B4)-OVA or isotype^(GL117)-OVA fusion protein conjugates without or with CpG (n = 4 from 2 individual experiments). Serum IFN-α level at 2, 4, and 24 hours after vaccination was measured by ELISA. (I) Percent in vivo OVA-specific killing 5 days after i.v. injection with OVA-Clec9A-TNE or OVA-isotype-TNE (both formulated with 5 μg of OVA), Clec9A-TNE, or 5 μg soluble OVA (n = 10–14 from 3 individual experiments). (J) C57BL/6 mice were injected i.v. with 5 μg of Clec9A-OVA, OVA-Clec9A-TNE, isotype-OVA, or OVA-isotype-TNE without additional adjuvant. Serum anti-OVA Ig titer was quantified 1, 2, and 3 weeks later by ELISA (n = 10 from 2 separate experiments). *P < 0.05; **P < 0.01; ***P < 0.001; ****P < 0.0001 by Tukey’s multiple-comparisons test.